For the third month in a row, we have created the Tallahassee Housing Statistics Infographic as a way to convey current real estate market conditions in the form of an image. You can download our real estate infographic here, and I encourage anybody with a stake in the Tallahassee real estate market to understand the important trends that we see developing. To say the market has taken a turn for the worse would be an understatement. While we haven’t determined any major factors that are causing the downturn, it is a downturn nevertheless and home sellers need to understand the changing landscape. Needless to say, this is not good if you are trying to sell a home in Tallahassee. We normally expect the market to heat up this time of year, instead we are seeing it cool off. While there are a lot of little things leaving an impact on our fragile housing market recovery, I suspect current trends are caused by a combination of factors. Lost equity, tighter lending standards, and the fact that the market recovered so strongly last year that a “breather” was likely to occur have caused the market to cool going into the normally strong Summer season. Lost Equity – Tallahassee has a fairly simple housing market. Historically, 20% of buyers are investors, 30+% are first time homebuyers, and just under half are people “moving around.” This last group, whether moving to or from within Tallahassee must sell a home before they buy a home. It is this last group that has been hit the hardest over the past 7 years. Either they are doing/ have done a short sale and cannot get a new loan yet, or they have sold (or are waiting to sell) their house and the amount of equity retrained after the sale was (or will be) lower than what they needed as a down-payment for a new purchase. So nearly ½ of our traditional demand has been seriously hampered by the equity lost when the market plunged more than 30%. Tighter Lending Standards – Lending standards are not too tight, they are just “back to normal” when banks made smarter lending decisions. But the standards changed at a time when we really need to help historically strong homeowners. I do not advocate more government intervention into the housing market, and whether they do or do not, this factor will lessen in intensity over time (as it truly relates to lost equity for down payments). 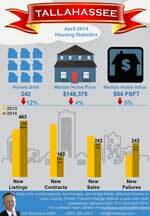 Market Breather – The market had a healthy year last year, home sales surged strongly. We cannot expect the recovery to go upwards in a straight line, as that would be far from typical. Many of the buyers in the market last year were “pulled in early” due to crazy-low interest rates, meaning the ones that would have waited for this year bought last year, and thus have reduced demand by buying early. I think this will pass before the end of the year. You can download this infographic as a .pdf file near the end of the first week of every month. Take a look at trends and choose your market entry/exit points if you are a discretionary seller or buyer. Of course, if you would like expert guidance and how to make the most of your current situation, just drop me a note and we can schedule a time to review your needs and wants in the Tallahassee real estate market.